Mary-Lou Weisman is an award-winning journalist and bestselling author. Her published books include My Baby Boomer Baby Book; Traveling While Married; My Middle-Aged Baby Book: A Record of Milestones, Millstones & Gallstones; and Intensive Care: A Family Love Story. Her essays, feature articles, interviews, and film and book reviews have appeared in many publications, among them The New Republic, Newsweek, Glamour, Vogue, Atlantic Monthly, and the New York Times. She has also contributed essays and commentary to Public Radio International. She lives in Westport, Connecticut, with her husband, a lawyer. 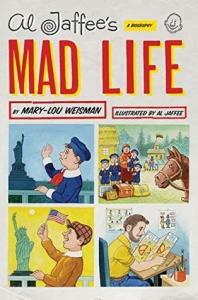 Mary-Lou Weisman and Al Jaffee have been friends for more than thirty years.